Use SignalFx to monitor Azure SQL Database via Microsoft Azure. Azure SQL Database: Shows metrics of a Database. Azure SQL Databases: Shows metrics of all Databases being monitored. DTU Percentage - Shows the DTU percentage of a SQL database. If this value is consistently high, it is likely that the database sees increased latencies. DTU Percentage Trend - Trend of the DTU used percentage. Data I/O Percentage - Shows the used percentage of Data I/O. Log I/O Percentage - Used percentage of Log I/O. Database Size Percentage - Percentage of the Database used. Successful Connections - Number of successful connections to the database. Failed Connections - Number of failed connections to the database. Connections Blocked by Firewall - Number of connections blocked by firewall. Number of Databases - Shows total number of databases being monitored. Top Databases by Total Storage - Stacked view of total storage aggregated by database. Top Databases by DTU Consumption percent - Shows the trend of DTU used percent for top databases. Top Databases by Connections Failed - List of the databases with top number of connections failed. Number of Blocked Connections - Number of blocked connections aggregated by database. Top Databases by Log I/O percent Lists the databases with top Log I/O. 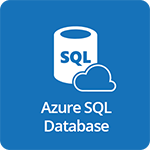 For more information about the metrics emitted by Azure SQL Database, visit here.